The album is a blend of sacred music and jazz improvisation, featuring renditions of Advent and Christmas texts and melodies. 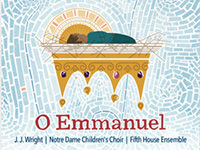 ND Children's Choir Album Tops Classical Music Charts! The new album from Dynamic Catholic is J.J. Wright’s bold experiment with a Christmas album that both surprises and challenges. It also brings unexpected delights of jazz to the season. The goal of Sacred Music at Notre Dame is to keep alive great musical traditions of the Western world. By training young people in the history and breadth of sacred music, the program aims to reinvigorate Christian churches through a new generation of parish musicians that can help lead liturgical services and also create new music. The Notre Dame Children’s Choir has initiated a new choir for singers with special needs, the Lyric Choir. For children ages 9 to 13, the Lyric Choir focuses on singing and experiencing sacred music in a welcoming choral community, musical instruction specifically geared to meet the abilities of students with physical, social, emotional, and/or intellectual challenges.